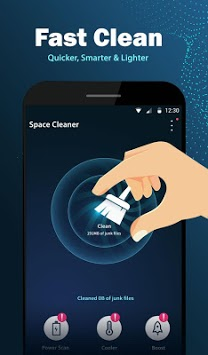 Space Cleaner can increase your phone's speed by 60 percent. With this application, you can free storage and remaining files, increase RAM, save battery life, and protect your private data. 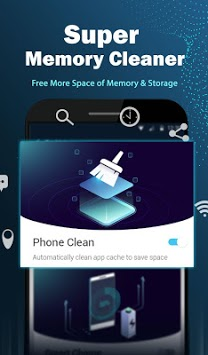 Your phone will more smoothly run with Space Cleaner! Free up memory by killing background processes and tasks, speeding up your phone so you can say goodbye to lag. 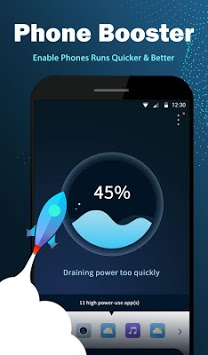 Boost your phone by one click and boost your phone up to 60%. Optimize the use of RAM and release memory to speed up your slow Android devices. Using this function will cool down phone when your CPU overheating. Smart save your device power by knowing when to automatically trigger Space Cleaner to keep your phone powered for long and never overheat. Quickly scan your phone, check the power consumption of your apps and settings, and effectively save battery life for you.